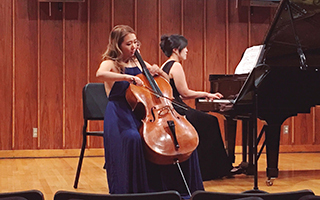 Sarah Han is currently finishing her Doctorate in Cello Performance studying under internationally renowned cellist and pedagogue, Tom Landschoot. She is also an active musician and instructor here in the Valley. Sarah started her music education when she was 8 in South Korea, then moved to the US to continue her education at James Madison University as well as a Master’s at Indiana University. She has been an active musician since she was 12. Sarah served as a principle of a number of youth orchestras in Korea. She has played with the Terra Haute Symphony Orchestra, Richmond Symphony in Indiana as well as the Phoenix Symphony. So, yes, Sarah can definitely play the cello and piano. But she’s also a wonderful human and teacher and the students that are lucky enough to work with her all agree. We couldn’t be happier to have her as a part of our faculty. Sarah joined our faculty in 2017.